In a large bowl, toss together the first six ingredients. In a jar with a tight-fitting lid, combine the salad dressing ingredients and shake well. Pour over salad and toss to coat. Layer a serving bowl with some salad leaves, and add in the tossed mixture. Cover and chill for 1 hour before serving. 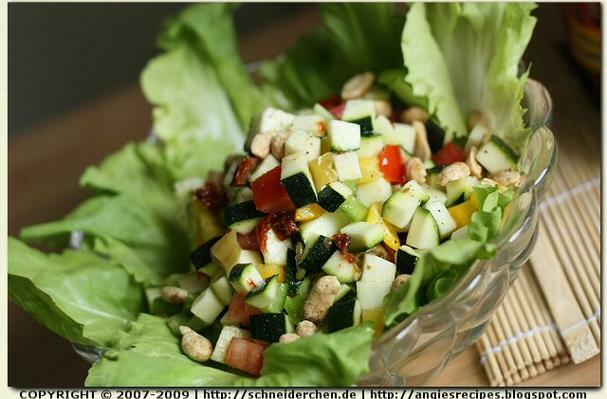 A combination of zucchini, bell peppers, sundried tomatoes, cherry tomatoes and peppery peanuts in a honey vinaigrette. With a couple slices of German pumpernickel bread, this makes a healthy, nutritious, and yummy lunch.